It’s that time of year when the days start getting longer, the sun’s rays feel a little bit warmer, and our minds anticipate the approach of spring. It’s also that time of year that I start itching–literally and physically; itching to spruce up the garden, go to the beach and generally spend more time outdoors, and itching physically from all the dryness my hair and skin have experienced from the cold temperatures and dry, indoor heated air of winter. Here are a few suggestions for revving up your circulation, sloughing off dull, dry skin and feeling smooth, moisturized and renewed. I’ve never been a big believer in expensive creams and lotions, but I do believe in natural and simple products that get results. 1. Use a natural-bristle “body” brush to aide your lymph nodes in eliminating toxins and boost circulation. (You can buy this type of brush in all natural products stores, including natural foods stores, as well as in many drugstores.) Simply brush your skin in small circular movements starting with the outermost extremities (hands and feet), working toward your heart as you go. Note: It’s best to do this just before your bath or shower. 3. If you’re a tub person, soften skin by adding a pint of fresh milk (or 1 cup powdered milk) to the tub while it’s filling. Soften nerves, too, by adding 10-12 drops of your favorite essential oil for a total relaxing, skin-softening experience. Lavender, ylang-ylang and neroli are all good choices. 15 drops of essential oil of ylang-ylang, neroli, rose, whatever you like. Mix together in a 100 ml brown glass bottle. Apply as needed. 5. If the skin on your face is looking a little lackluster, apply an exfoliating and/or brightening mask 1-2 times per week. One of my favorites is Pangea Organics Facial Mask with Japanese Matcha Tea, Acai & Goji Berry. Careful you don’t scare the cat or the kids while the mask is on your face working its magic. It resembles mud with acai and goji fruit blended in, but leaves your skin feeling softer, smoother and brighter. 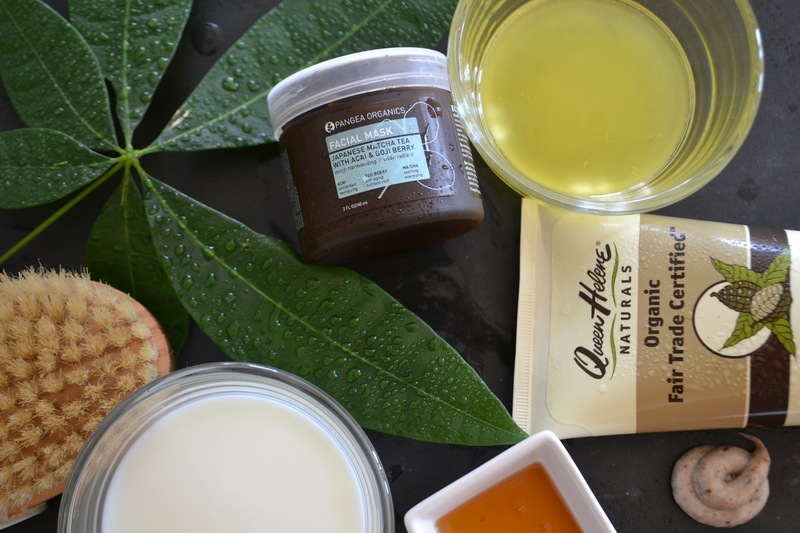 Another super quick and easy moisturizing mask can be found in the pantry. Honey is a great moisturizer. Spread a thin layer over freshly-cleaned, still damp skin, leave on for 3-5 minutes and rinse with tepid water. It’s also important to avoid cleansers or toners containing alcohol, which are too drying for even the oiliest skin at this time of year. Look for moisturizers and toners with hyaluronic acid, a highly-effective humectant, which is purported to hold 100 times its weight in water. Just be sure to follow with a moisturizer if you’re using hyaluronic acid in a toner. Happy scrubbing, soaking and slathering! Thank You Moira for sharing your story!